R.J. Tilley offers superior residential plumbing and remodeling services to the Mechanicsville, VA area. 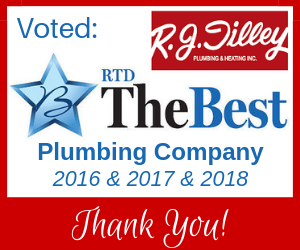 For over 40 years, R.J. Tilley has provided central Virginia homeowners with high quality plumbing services. Over time, our expertise has developed beyond plumbing to incorporate full service kitchen and bathroom remodeling. Our staff of seasoned plumbers and carpenters can accomplish just about any project or job. Are clogged drains getting in the way of your day to day? Our team can fix that! Our team can locate the root of the problem, whether it’s a simple clog in your bathroom or a more serious blockage deeper in your plumbing lines. In some cases, we use video inspection services to identify the source of a clog and to inspect the integrity of your drain pipes or sewer line. R.J. Tilley Plumbing & Heating, Inc. has all of the latest water heaters. If its time for you to upgrade your hot water system, let us guide you through of your options. We install all different types of water heaters including, electric, gas, hybrid, and tankless water heater systems. Tankless systems are very efficient and are available in gas or electric models. Water heater regulations have changed. Many new water heaters require more space and our team can handle all of the plumbing and remodeling required to update your water heater to the latest models. Let our plumbers fix your leaky faucets, shower heads or any other plumbing fixture. In many cases leaks and drips can be repaired, saving hundreds of dollars compared to a costly fixture replacement. If needed, our team can install new fixtures for you – whether the replacement is needed due to failure of existing fixtures, or you’re just upgrading to improve the look of your plumbing fixtures. Transforming kitchens and bathrooms with custom remodeling is something we’ve been doing for over 20 . As your general contractor, we’ll take care of everything from start to finish, so you don’t have to worry about a thing. Interested to learn more about home remodeling? Visit our showroom to get design ideas and speak with a designer.